The group show Time Warp showcases work of eleven artists interpreting imaginative and metaphorical boundaries, concerning the twisting and distortion of time and space, using painting, photography, printing and ceramics. 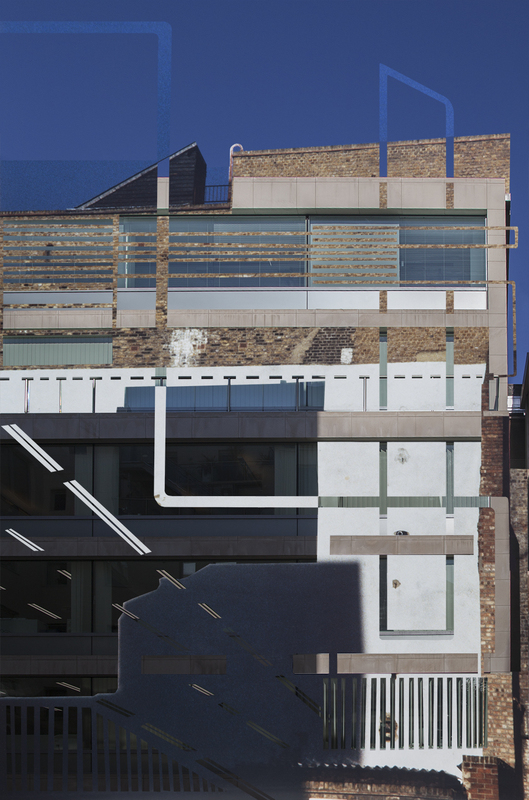 The series Distorted Memory is an amalgam of specific London locations photographed 20 years apart. Just as memory appears to be experienced on an individual level, projecting a distorted reconstruction of the past, in this work my intent is to merge the past with the present, creating a fusion between the two. Instead of offering a straightforward representation, the resulting image is a construct of then and now, revealing and concealing layers of time with fragments referencing present structures. Unsurprisingly, most of the buildings photographed 20 years ago, have long gone by now. They are replaced by new-builds, or construction sites. 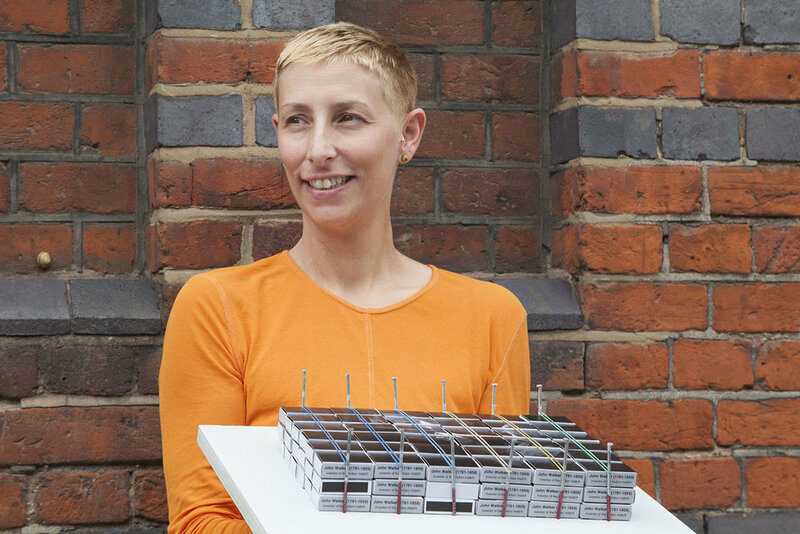 The series is also a social commentary on the ruthless expansion of the property market, where according to a UK law, certain new-builds are exempt from paying the VAT making it financially more viable to demolish an old building and replace it with homogeneous, prefab apartments. Stamatis Zografos, Uli Gamper and Eva Bachmann worked on a collaborative project to commemorate John Walker, the inventor of the friction match. 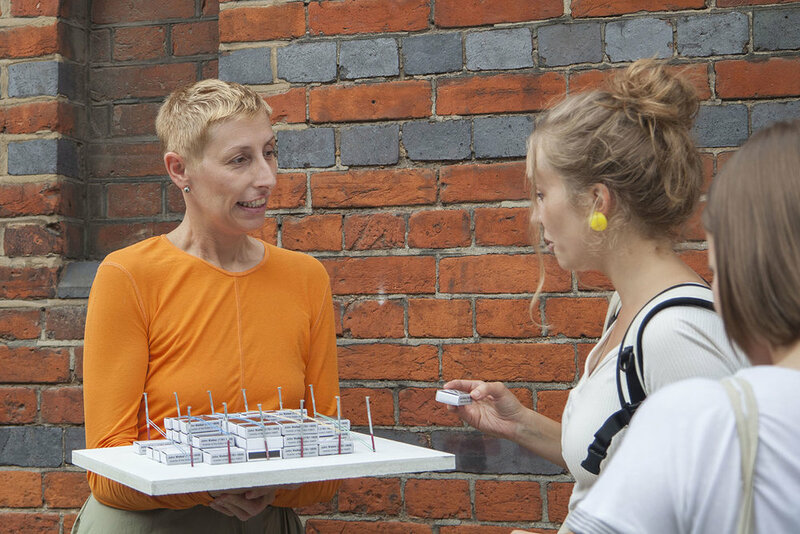 The installation was displayed with other 9 finalists at Historic England’s Immortalise Season. The matchbox installation comprises an ephemeral and participatory method of commemoration that celebrates Walker and his invention truly, and places Stockton-on-Tees on the map. 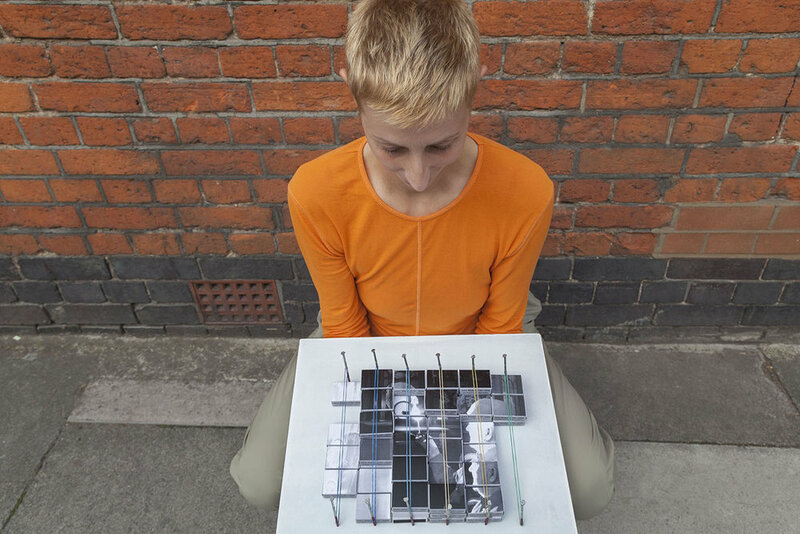 Considering that Walker’s identity is not certain and in order to commemorate the ambiguity behind his identity, an image of him is ‘invented’. This image is formed when matchboxes, operating like pixels, are placed the one next to the other in the right sequence. The image has layers thus depth. This relates to the three-dimensionality of memory, as memory is produced and preserved in space. The lower the layer is the more faded/distant the image/memory. The visitors are asked to take away a (free) matchbox thus de-assemble the image until it disappears. This is the end of the installation but not the end of Walker’s commemoration. His memory is spread out randomly in the city through the matchbox cover design. A performative and participatory method of commemoration for John Walker and his invention was also introduced. 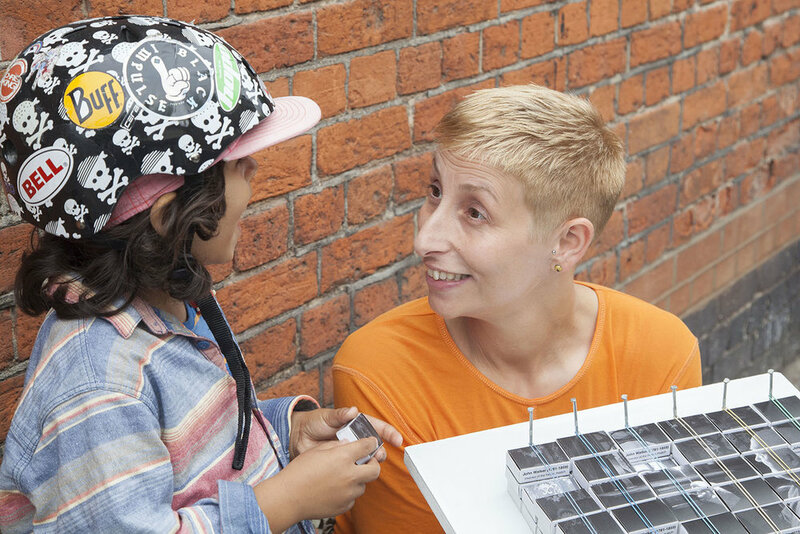 Re-appropriating Hans Christian Andersen’s famous short story The Little Match Girl, our performer gave away (free) matchboxes to clueless passers-by until Walker’s image dissolves. The performer engaged with the public and informed them about Walker and his invention. The performance took place by the gate to Bow Quarter in Bow, London. This building was originally the Bryant and May match factory. It was also the site of the Match Girl’s Strike in 1888 led by Annie Besant. The edited film has neither a beginning nor an end, and it is on a constant loop. This circular narrative respects fire’s own development in time, from life to death to eternal return. The ephemeral nature of John Walker’s commemoration relates to the quick burning of matches. 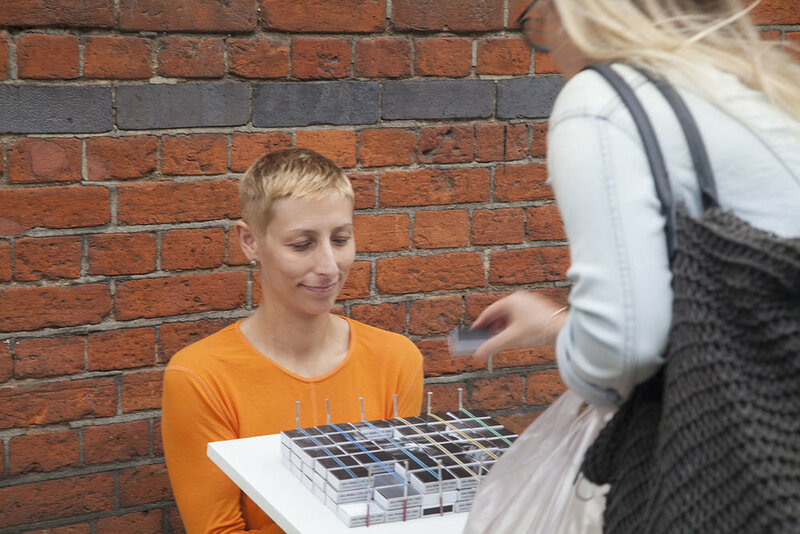 The random matchbox distribution through performance and public participation reflects fire’s random proliferation in the urban landscape since the friction match was invented. The method of commemorating John Walker through the distribution of matchboxes is inspired by the subliminal power of matchbox cover design that was historically used as a tool for propaganda and communication (a tool widely used during the World Wars and in Communist countries). It is how we make people immortal. But who decides who and how we remember? Immortalised explores the ways people and events have been commemorated in England, by the statues, the plaques, shrines and murals that mark heroic, quirky, inspirational and challenging lives. But while some people are heralded, others are unrepresented: women, the working classes and people of colour are much less likely to have a place on the plinth. An immersive exhibition, Immortalised invites you to enter four giant monuments that hold the key to our memorial past and future. From a Trafalgar Square lion to the Brighton Peace ‘Angel,’ to the boots on the contested statue of Edward Colson in Bristol, these will each explore how, why and who we remember, from the well-loved and famous, to the lost local hero. Immortalised also reviews the challenging histories of some of those celebrated, and looks at how we might immortalise in the future, long after we are gone and perhaps, forgotten. Delving Into Distant Memories series questions the notion of displacement, our sense of belonging and the ambiguity of our past experience. I understand memory as an organic thought process, shifting and adapting to our formed world-view. The title refers to my experience of the transitional state when waking, when a vivid dream feels credible, almost tangible. This unsettling feeling, leaves me pondering whether these imagined places were ever part of my real experience or whether they were merely a generic representation of our collective memory? Being part of London Creative Network has enabled me to learn operating a large format camera, specifically for my work ‘Reliefs’, photographs of chimney breasts revealed on London's facades. Rather than seeing them as a straight forward document of an architectural feature, I see them as sculptural reliefs. At Photofusion I received a bespoke tuition tailored to my project. During the programme, I learnt how to use the camera and how to develop and scan the negatives. The final stage was about printing the 4x5 negatives. Working with large format camera helps me to slow down. It is an antidote to the current trend, where taking photos has become accessible to almost everyone. I compare working with the large format to photographic mindfulness. It forces me to think, contemplate and focus, physically engage with the subject. It draws me in. I get absorbed, physically and emotionally invested in the process of making. It strengthens my conviction of my intention and the relevance of what I shoot. With each photograph taking about a half an hour to set up, it reinforces my commitment to the subject. Although the method is laborious, costly and lengthy, ultimately it is highly rewarding: The charm of the alchemic printing process keeps me in suspense as the image resurfaces. It is impossible to reproduce the finely grained film texture and all the details on a digital format. I will continue refining the acquired skills in my current and future projects. Tacked away from the busy streets of Hackney (London), I stumbled upon Andre Street, a small passage lined with railway arches. The signage and the textured layers of overlapping paint reveal what is happening behind the closed doors when open for business - most of the arches are converted into car mechanic workshops. In their unpretentious appearance, they seem time-less, as if one entered a time warp of the unchanged neighbourhood. With the series Railway Arches, I am investigating visual realms of accidental creativity done unintentionally. 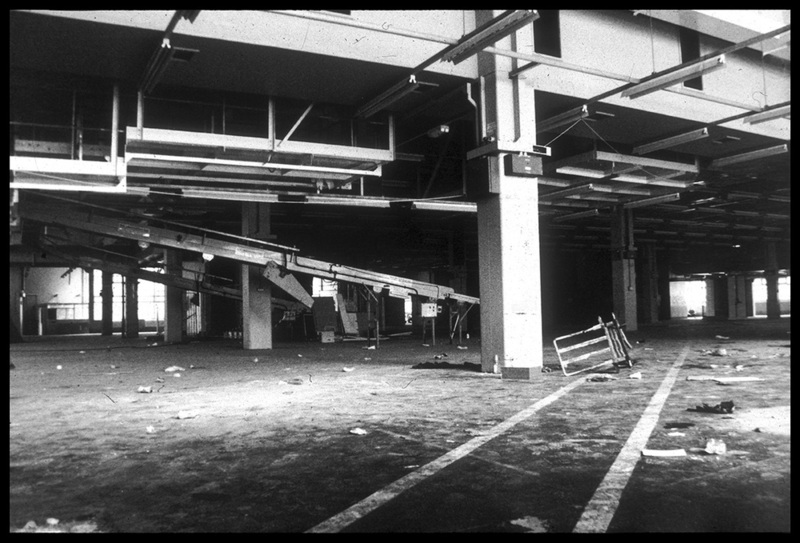 Devoid of people, these images serve as a testament to creative processes done by unsung workers. On first sight, the image depicts the wall of a residential area. On closer inspection, it becomes apparent that it is a photograph of a collage, distorting the perception of depth. Some elements from the background come to the fore and the shadow transforms into a solid object. These distortions emphasize my personal preferences for certain elements over others. The work aims to open a dialogue about degrees of subjectivity in the act of looking at, and perceiving, our environment. "The LIP Annual Exhibition, now in its 29th year, provides a platform for members to exhibit their best work to be shared with a wider public audience. This year our new submission process is designed to include more members than ever in the exhibition! A series of talks and events will feature throughout the exhibition period, with leading figures from the photographic world including: Dewi Lewis the celebrated photobook publisher; Simon Roberts, an outstanding landscape photographer with an emphasis on human geography; Tanya Houghton, presenting her project ‘A Migrant’s Tale’ - a collection of narrative explorations told through the language of food; a panel discussion on 'The Street Today', and more. The exhibition and associated events will attract a huge audience and will be a great showcase for LIP members." Book launch of ‘Engaged Urbanism: Cities and Methodologies’ by Ben Campkin & Ger Duijzings at the Free Word Centre on Friday 9 December 2016. My work ‘Tracing Memories’ is featured as a contribution for Stamatis Zografos essay ‘Buildings on Fire – Towards a new approach to urban memory’. Delving Into Distant Memories series questions the notion of displacement, our sense of belonging and the ambiguity of our past experience. I understand memory as an organic thought process as it shifts and adapts to our formed world-view. I am displaying three photographs from an ongoing series Window – A Threshold Between the Inside and The Outside World. The images portray the window as a “visual confession of their inhabitants”, highlighting the spatial ambiguity between the external and internal space. I am delighted about my image 'Wobbly Legs' being chosen by Martin Parr as a winner of the 'Weird & Wonderful' category in Time Out's photographic competition. It was launched in connection with the 'Strange & Familiar - Britain as Revealed by International Photographers' exhibition at the Barbican. I came across 'Wobbly Legs', a surreal looking bench, next to a busy road on Morning Lane, Hackney. The rickety street furniture reminded me of someone after a night out, unsteady on their legs, twisting and shifting to try to keep their balance. With my work I aim to alter our view of the ordinary by exemplifying its creative essence, adding a new visual experience, shifting our awareness, so that we notice what often goes unnoticed. Cosmic Dance is a poetic interpretation of the River Lea’s waste. These images of the contaminated River seem to mirror the otherworldly qualities of interstellar particles gracefully floating in the galactic void. My intent is to bewilder the viewer, engendering a sense of disbelief and hence unsettle our accepted sense of reality. With my work I aim to alter our view of the ordinary by emphasizing its creative essence, adding a new visual experience by shifting our awareness, so that we look at what often goes unnoticed. I was interested to present the series in a relevant context. Here, Mile End Pavilion’s location adjacent to Regents Canal lends itself as a highly appropriate venue for showcasing the dreamy qualities of urban nature. "Uncertain States is an artist-led project that publishes and distributes a free quarterly broadsheet newspaper showing lens-based-art. We also hold monthly talks that focus on contemporary photography; we organise and curate an annual exhibition to showcase our contributor's work. Formed in 2009 by Fiona Yaron-Field, David George and Spencer Rowell, the group has grown over the past five years from a small core to a loose confederacy of over 100 writers, artists and academics who share the same ethos: that is, to create a platform for work that reflects some key social and political concerns and challenges how perceptions are formed in society, whilst at the same time nurture a growing community of independent artists who seek an alternative outlets for their artistc practice." Seemingly insignificant, yet peculiar in appearance, these facades of London’s residential neighbourhood have sparked my sense of wonder. Windowless, with protruding gables, they looked surreal and displaced, as if left over from a dystopian science-fiction novel. In this series, I aim to shift the view of the ordinary by exemplifying its creative essence, adding a new visual experience. My images are built on multi-layered meanings: There is a common thread of documenting, collecting and classifying urban structures which runs through my work. Like an urban anthropologist, I de-code the language of mundane spaces, tracing cultural and historical references through layers of time. Architecture is my source of inspiration through which to convey these lines of thought. In keeping with Bernd & Hilla Bechers’ methodical approach, whose work has deeply rooted my formal language, I developed a systematic way of collecting, cataloguing and documenting architectural elements. I am interested in challenging conventional understanding of architecture by adding another meaning to it. My intent is similar to Bechers’, where the topological and architectural documentation became merely a side effect, complementing their main inspiration. Captivated by what they called ’accidental beauty’ of industrial buildings, they referred to architecture as ‘Anonymous Sculptures’. Following the concept of serial representation through a repetitious framework, the facades appear to be removed from their usual context and take on a new layer of meaning. Hence the on-going series Reliefs is a visual inquiry into the unnoticed architectural elements found in residential areas. The intent is to shift our awareness, noticing what often goes unnoticed. I am investigating visual realms of accidental creativity done unintentionally. Devoid of people, these images serve as a testament to creative processes done by unsung workers. Here, anonymous streets transcend into formal abstraction. "This exhibition marks the final stage of New Creative Markets, a three year professional development programme for early to mid-career artists. Photofusion’s partnership in the consortium with Space, Four Corners and Cockpit Arts, part-funded by the European Regional Development Fund, enabled us to provide much needed professional creative support tailored to different photographic genres and needs. NCM Exposed features over 100 photographers who participated in the programme, each photographer selecting one image representative of a captivating story, concept or visual style. The result is a lively and dynamic salon-style exhibition, showing the diversity of photographic image-making created by London-based photographers. Tucked away behind the busy streets of Hackney I stumbled upon Andre Street, a small passage lined with railway arches. The signage and the textured layers of paint revealed what was happening behind closed doors - most of the arches had been converted into car mechanics workshops. In their unpretentious appearance they seemed timeless, as if one had entered a time warp, an unchanging neighbourhood. The series stands as a social comment depicting the survival of a long-standing community of small businesses amidst Hackney’s drastic transformation. Devoid of people, these images serve as a testament to creative acts done by unsung workers. Here, an anonymous street transcends into formal abstractions. Tracing Memories is visual exploration of the Kings Cross Fire in 1987 and its direct implications to the architectural changes made after the disaster. The eerie impressions of the aftermath drawn with charcoal create a literal link with the burnt wood. The dark images of the fire are contrasted by the transparent, austere looking interiors of the rebuilt underground. Like layers of time, where memory tends to blur between now and then, the multi-layered images fade in and out.